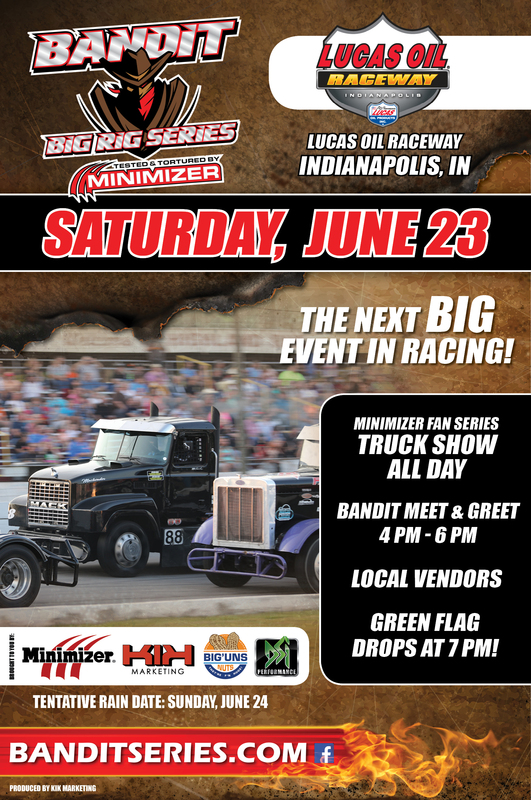 The Bandit Big Rig Series Tested and Tourtered by Minimizer - Presented by Palmer Trucks is coming to Lucas Oil Raceway on Saturday, June 23rd!!! With Bandits racing around the oval track at speeds of up to 100 MPH, you know things are going to get crazy! Racing starts at 7PM but don’t miss out on the pre-race activities (i.e. truck show, 4PM-6PM Driver Meet’n’Greet, and much more). As a reminder, kids 8 and under go FREE with paid adult (limit 3 kids per paid adult ticket).